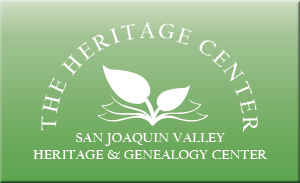 The San Joaquin Valley Heritage & Genealogy Center was created in 1993 as a cooperative effort of the Fresno County Public Library and the Fresno County Genealogical Society. It unites the Library's local and California historical collections with the extensive library of the Society. Total holdings consist of approximately 30,000 books and pamphlets, 5,000 microforms, 300 CD-ROMs, and many other types of research materials. Detailed descriptions of the Heritage Center's holdings can be found by following the links on its home page. The Heritage Center's particular strengths are in the fields of Fresno County history and American genealogy. Government documents, newspaper clippings, oral histories, photographs, ephemera, and many other materials document the history of Fresno County, from the days of the Yokuts and Monache (Mono) Indians down to the present time. The genealogical collection is strongest in books, pamphlets and journals which represent genealogical resources from every state in the country. Additional noteworthy Heritage Center collections include San Joaquin Valley history, California history, William Saroyan, and international genealogy. All collections do not circulate and may be used only in the Heritage Center. Photocopy and microprint facilities are available. Questions may be submitted to us via phone, by standard mail, or by email. We strongly recommend visiting the Heritage Center in person, as it will give you a better idea of what we have available, and faster service should you need photocopies or microprints. For email responses, we require at least one working week. Responses which require use of standard mail may take longer than one week.